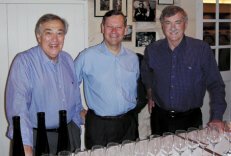 In 2006 and 2007 I reported on my first tastings of the wines of Tapanappa, the premium Australian label launched in 2002 by Brian Croser, one of the great names of Australian winemaking. Croser found fame as owner and winemaker at Petaluma, one of Australia’s icon estates. In late 2001 Petaluma was taken over by the giant Lion Nathan group. But within a year Croser had launched this new venture with long-time associates Arnould d’Hautefeuille of Champagne Bollinger (center of picture) and Bordeaux’s Jean-Michel Cazes of Château Lynch-Bages (left of picture). Importantly, the partners acquired a superb 30-year-old vineyard in the relatively new designated region of Wrattonbully. The Whalebone vineyard is the source of their red wine grapes, and Croser managed to secure access to 50% of the Chardonnay grape crop from the famous Tiers vineyard he had planted for Petaluma in the late 1970s. The Petaluma Tiers Chardonnay built a reputation as one of the southern hemisphere’s best, so securing access to this fruit is quite a coup for the new operation. I interviewed Brian Croser at the launch of his the first Tapanappa, and have been lucky enough to taste every wine so far released. I have to say this latest tasting, where I had the chance to compare the two most recent vintages of the Tiers Chardonnay, Wrattonbully Merlot and Wrattonbully Cabernet Shiraz, was utterly convincing that these wines are some of Australia’s best. There is a superb sense of place to each of the wines, and a beautifully realised marriage between the ripeness and concentration that Australia can provide, and the finesse and restraint that great terroir allied to sensitive winemaking can achieve. Though not cheap at around £30 per bottle, I can give all of these wines my unhesitating recommendation. Tapanappa is a very class act. The Tiers vineyard was planted in Piccadilly by Brian Croser in 1979. The 2008 vintage was an unusually hot one, and the fact that this wine retains such a vivacious, keen personality is surely down to Croser’s decision to pick a full two weeks earlier than normal. The wine has a beguiling nose where creamy, oatmeal and meringue notes marry to lime zest and subtly peachy fruit and an undertow of something mineral and stony. On the palate it has a braod texture and weight, but the fruit is cool, with a melon and apple character rather than anything more tropical, and the supporting oak seen just as a sheen of light vanilla over a solid mineral and lemon acidity. There is good concentration here too. 93/100. £35.00, see all stockists on wine-searcher.com. This is only the second vintage of the Tapanappa Pinot Noir, sourced from the Fleurieu Peninsula, a few kilometres from the ocean near McLaren Vale. It has an immediate charm and delicacy, with soft, curranty and gently smoky aromas leading onto a palate that somehow manages both intense fruit sweetness and elegant freshness. There’s a dry, savoury, really quite Burgundian undertow to this. It is low-cropped from the Foggy Hill vineyard (densely planted with Burgundian clones) and aged in French oak only 30% of which is new. It has lovely persistance in the mouth, its elegant, quiet layers unfolding slowly into the finish. Subtle and superb stuff. 93/100. Around £23.00, Edencroft Fine Wine, Fine & Rare Wines. See all stockists on wine-searcher.